One frequent argument I have with my boyfriend is whether we should apply to compete in The Amazing Race. To him, it’s a chance of a lifetime, but to me, it’ll be the “what went wrong” period in our relationship. 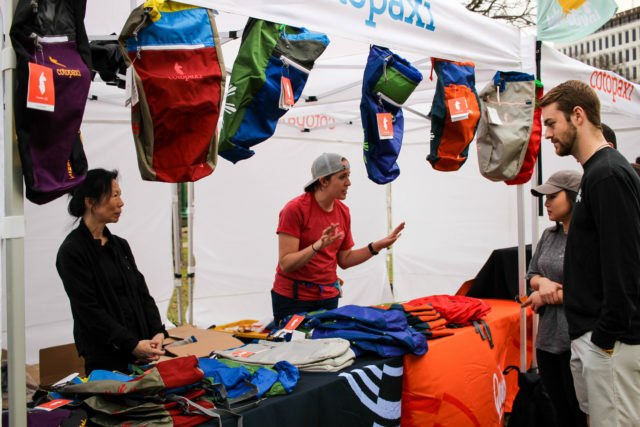 The debate is still ongoing, but fortunately for us, outdoor gear company Cotopaxi brought their Questival to the Alamo City for the first time last week. 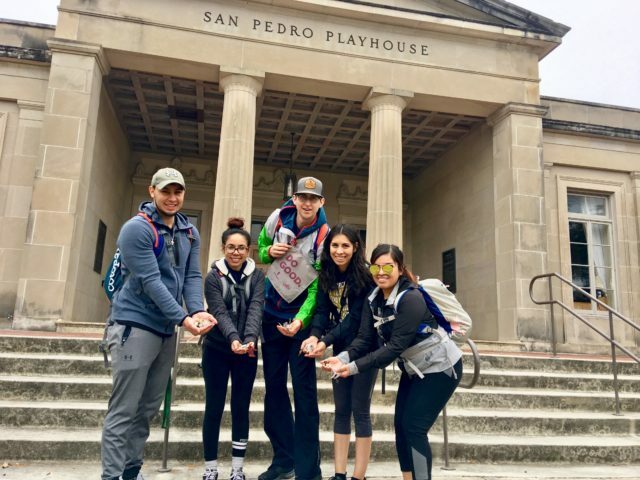 Described as “The Amazing Race with a social good twist,” the 24-hour adventure race gave us the chance to test our teamwork capabilities alongside four of our friends. Team Hungry Hungry Hippogriff. Photo by Selina Bonilla. Since 2014, the Questival has traveled to over 50 cities in the United States to inspire togetherness, kindness and adventure. Teams race to complete as many challenges as they can during the 24-hour time frame. With more than 100 challenges, participants are taken across the city and pushed out of their comfort zone. When you register for the Questival, you get a free 18L Cotopaxi backpack. Photo by Selina Bonilla. As soon as I heard about the adventure race, I knew this was something my group of friends would be interested in. And if you followed our South Texas Maize adventure, then you’re aware that this was going to be just as much of a fiasco as the corn maze. 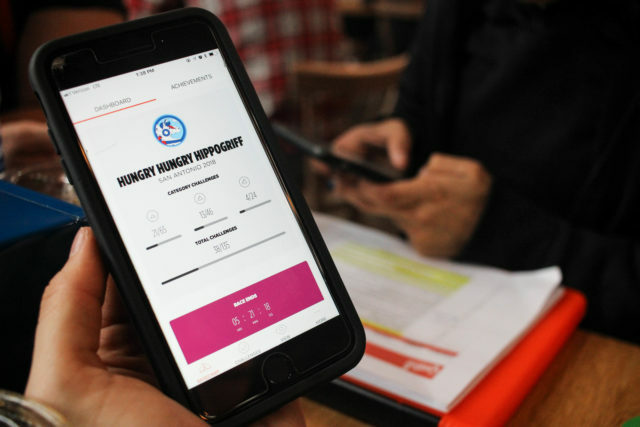 Prior to the event, our team got to pick out our name—in honor of our love of Harry Potter, our team was Hungry Hungry Hippogriff—and download the official Questival app required to submit challenges. 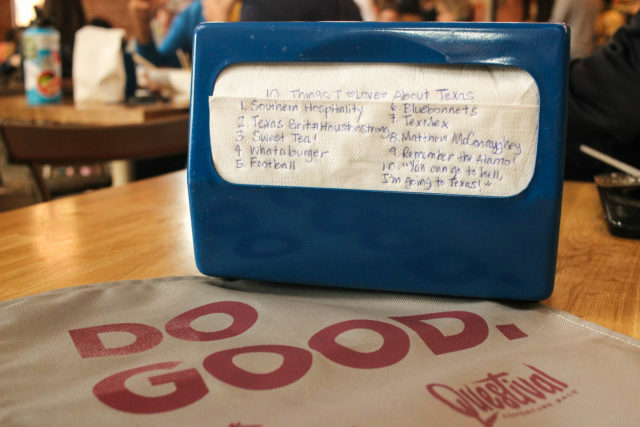 Questival also sent out the list of challenges 24-hours in advance to give teams time to prepare. In retrospect, Hungry Hungry Hippogriff should’ve prepared. The Questival has its own app to submit challenges. Photo by Selina Bonilla. 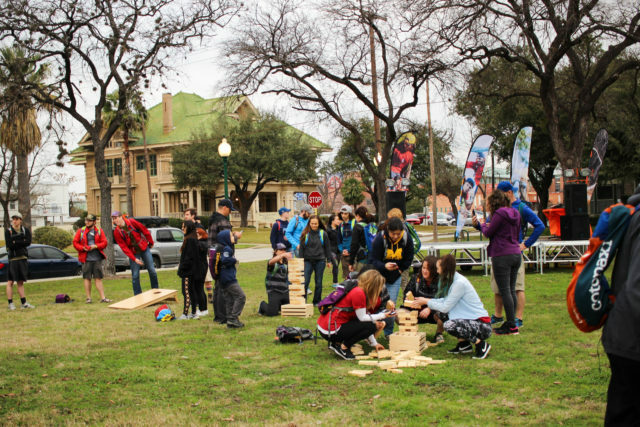 The event started with a check-in party hosted at the Westside’s Crockett Park. 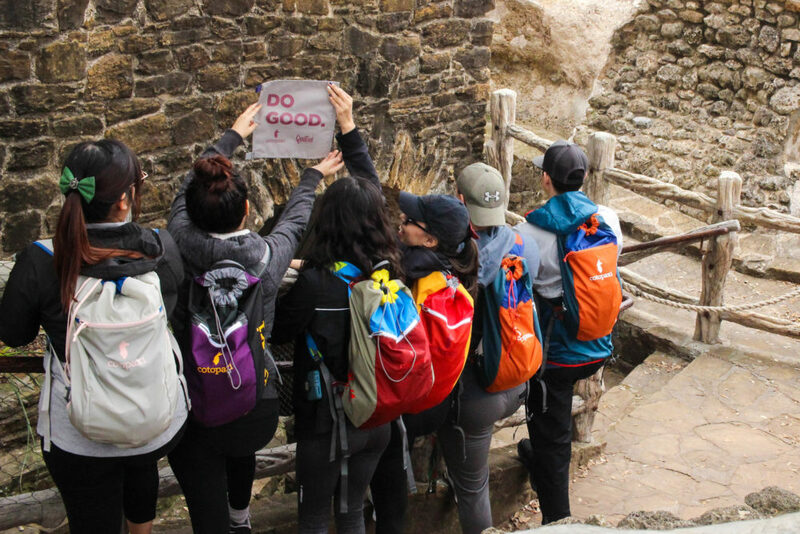 There, participants picked up their backpack and team totem, played yard games, competed in some launch event challenges, and took part in a “Do Good” chant. 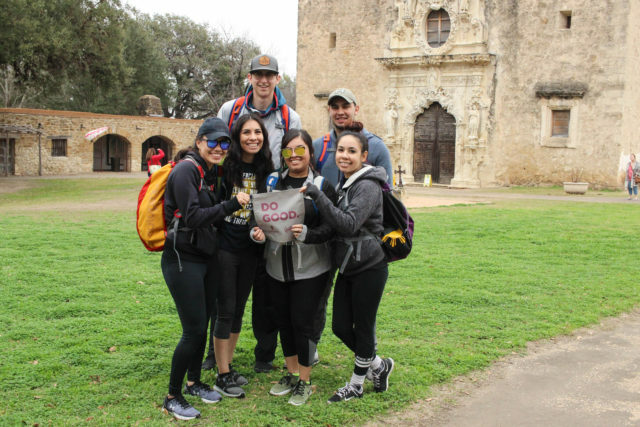 On Feb. 16 at 7:30 P.M., the 51 San Antonio teams fanned out across the city to set off on their adventure. At that time, we were still a team member down, who overslept during their nap—ahem, Nadia. The launch party had tons of yard games for participants to play. Photo by Selina Bonilla. Logically, our team decided our first stop should be food. We made our way to the local Wendy’s to devour Texas’s state dish (one of the challenges). Chowing down on some chili, the Texas state dish. Photo by Viviana Bonilla. Afterward, we made it to downtown and were able to complete ten of the challenges, which included taking a photo at the Alamo, doing tai chi at the Riverwalk, singing at Rosita’s bridge, getting flour thrown at one of our faces, waltzing at a crosswalk and picking up cigarette buds at Hemisfair Park. Picked up 25 cigarette buds within eyeshot of Hemisfair Tower—don’t worry we used hand sanitizer. Photo by Gabriela Gonzales. By midnight, we were finally walking in the door of my sister’s house with 19 challenges under our belt and ready for bed. But we still weren’t done yet. We started a campfire in her backyard and completed five more outdoor challenges. We called it quits at around 2 A.M. The plan was to get an early start on our day by waking up at 8 AM. The issue in that idea is that most of us are not morning people. So when 8 AM rolled around, half of us—including myself—were still sound asleep. The early start turned into a delayed start, and we tried to do some of the challenges during breakfast, like eating a mouthful of mustard and doing cartwheels in the front yard. By 2 P.M., we’d gone to the San Jose Mission, gave flowers to my mother, and used my dog to recreate the iconic Dirty Dancing lift scene. It was only the afternoon, and we were nodding off in the car on the way to one of the Questival checkpoints at San Pedro Park. The checkpoint required physical activity, and by our 15th burpee, we were feeling pretty awake. Picking up trash at San Pedro park. Photo by Viviana Bonilla. When it came to lunch, we decided the Pearl Brewery was the spot. Not only did it have great food options, but we knew it would allow us to get more of the challenges completed. 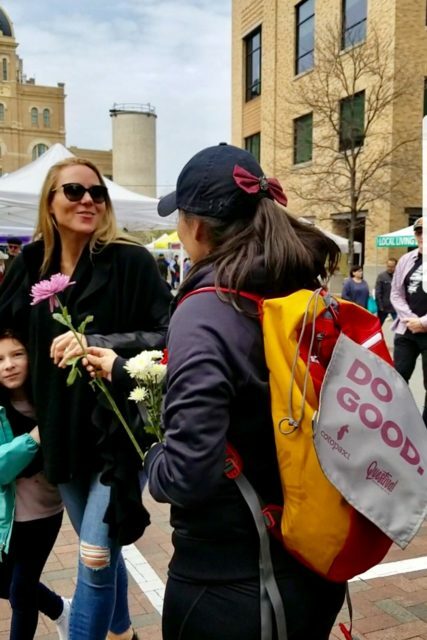 Passing out flowers at the Pearl. 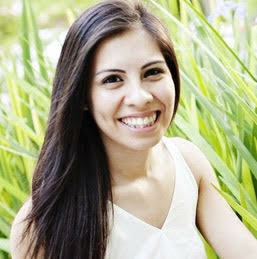 Photo by Gabriela Gonzales. Through the app, we are able to witness other team’s submissions, and it was during lunch that we realized that we were falling behind. It dawned on us that we spent most of our time sitting and trying to figure out what we should do next. As we scribbled things we loved about Texas on a napkin and chowed down at the Pearl Food Hall, we discussed how we really should’ve planned and strategized. Writing a note about 10 things we love about Texas and leaving it for someone to find. Photo by Selina Bonilla. After the last checkpoint, we stopped at North Star mall to get two challenges done and then went to UTSA’s main campus. Saying we were exhausted was an understatement. This was the most activity we had done since… well, the South Texas Maize. With the app closing in about an hour and a half, we set out on a mission to knock out as many challenges as we could. We became quick and efficient—the fire had ignited way too late in the game. 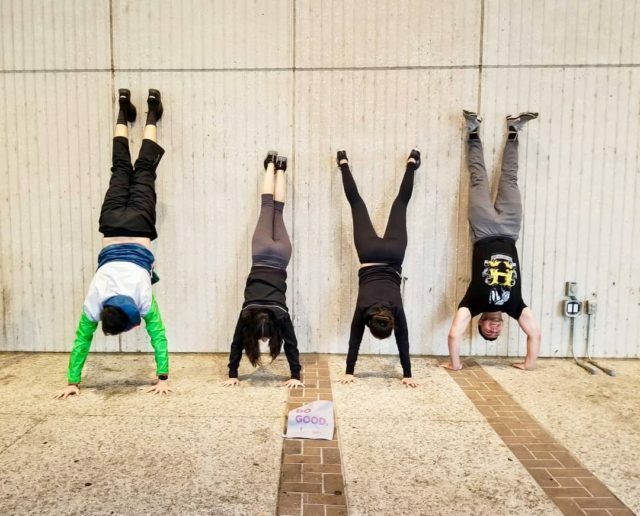 Wall-supported handstands at UTSA. Photo by Nadia Gonzales. The Questival was hosting a closing party at Revolucion Coffee + Juice where prize winners would be announced. 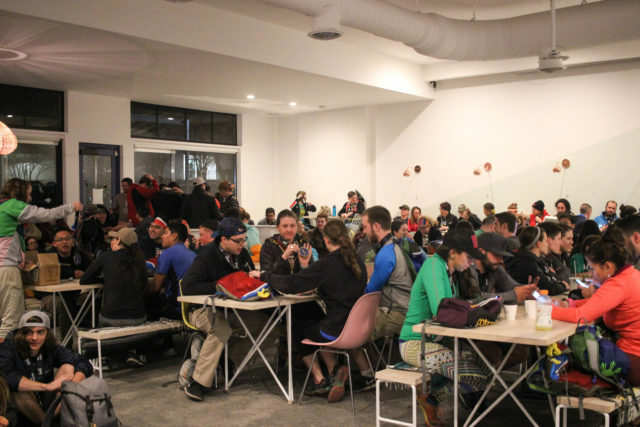 The 51 worn-out teams filled the cafe, chatting about their day’s adventures. As the organizers prepared the prizes and looked over final tallies, there was a moment when all the teams sang along to Bohemian Rhapsody simultaneously out of tune. It was during that period where you felt the unity that the Questival promotes. Closing party hosted at Revolucion Coffee + Juice. Photo by Selina Bonilla. Despite team Hungry Hungry Hippogriff’s efforts, we didn’t win anything. It didn’t come as a surprise. To win, your submissions had to have the most votes by the other teams or the public, and because the Questival app would glitch, submissions weren’t viewable until hours later. Our last minute submissions were essentially useless. 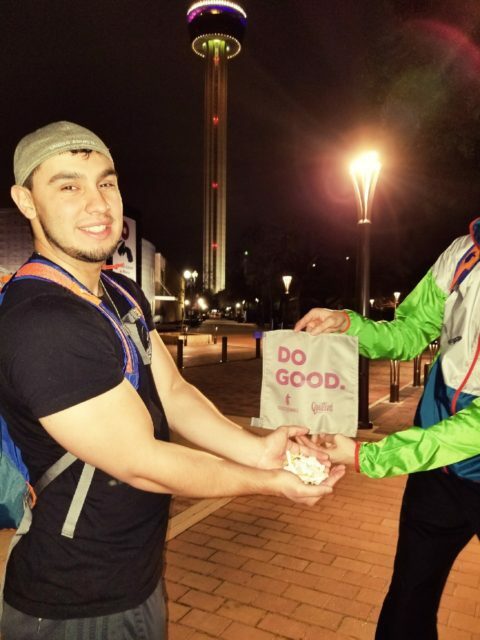 This was the Questival’s only downfall, but something their organizers did their best to address. Overall, we had a great time doing stuff that we would never have done on our own. We called parents and former teachers to tell them that we appreciated them, we told a store manager why we loved her store, we bought food for a stranger and even made a 90s sitcom intro. While I don’t think we are nowhere near ready for The Amazing Race, we learned what we needed to improve on and are ready for next year’s Questival if they return! 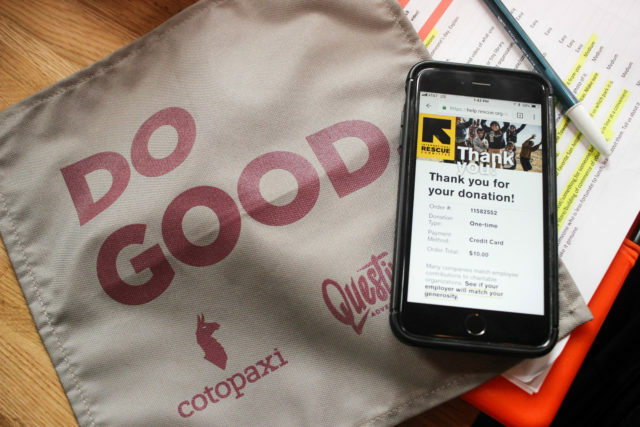 Cotopaxi donates some it’s annual revenue to nonprofits like International Rescue Committee. Photo by Selina Bonilla. You can view Questival’s 2018 tour dates on their website. 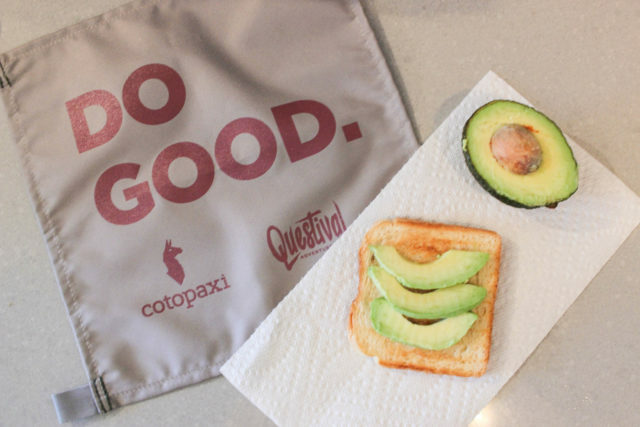 Cotopaxi donates a portion of their annual sales, including their Questival tickets, to nonprofit organizations that help alleviate poverty. Thanks to the Cotopaxi team for waiving the entry fee for Selina and the Hungry Hungry Hippogriffs.